WISCONSIN DELLS — Tom Schmidt of Countryside Golf Club was honored Nov. 13 with a Distinguished Service Award from the Wisconsin Athletic Director’s Association. 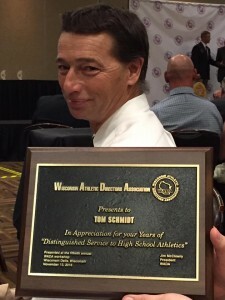 Schmidt was the District 4 honoree at the 2016 WADA awards banquet at the Kalahari Resort and Conference Center in the Wisconsin Dells. The program also featured the 2016 Hall of Fame inductions. “Boys and girls of Kaukauna area schools have greatly benefitted form the generosity of time and resources provide by Tom Schmidt. “For years, Schmidt has been a key supporter and organizer in helping the Kaukauna boys and girls golf programs and the cross country program. “His work behind the scenes to adjust league schedules, host conference meets, individual events, playoff events, fundraisers and banquets at Countryside Golf Course have been priceless. Schmidt was nominated by Kaukauna High School Athletic Director Kyle Schleis. 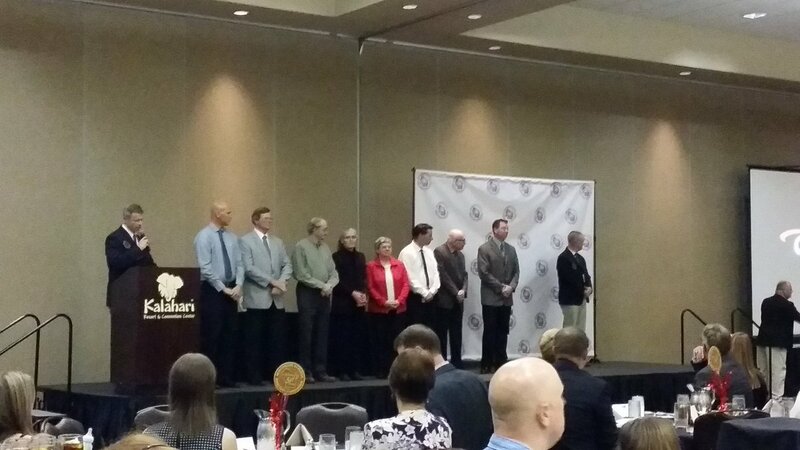 Recipients of the Distinguished Service Award are chosen at the WADA Spring Caucus meetings by each of the seven districts throughout Wisconsin. Those honored may include school administrators, game officials, team physicians, groundskeepers, maintenance personnel, members of the news media, or any other contributors to the interscholastic athletic program. Tom Schmidt, Countryside Golf Club. Where will you have lunch on Black Friday?